These innovative new touchscreen compatible ski gloves are the successor to the ever popular eGlove F3 Ski range of touch screen gloves, a perennial favourite that has been heavily tested in the harshest of sub-zero conditions across the World. The robust components keep all the elements at bay with the self closing ports on the forefinger and thumb digits, keeping your fingers fully protected until you need to pop them out and answer a call, take a picture or easily get to your zips. 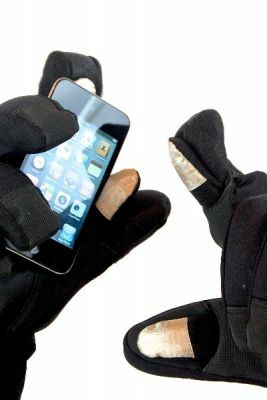 Even when you do slip your fingers out of the main glove, the special inner lining keeps them warm and prevents exposure to the biting wind and freezing cold outside, while the high-tech conductive pads allow you to use your smartphone or other touchscreen device without the inconvenience of having to remove your gloves. 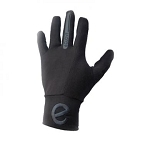 The eGlove eSki gloves are a truly ingenious solution to the problem of answering an important call or replying to an urgent text message in freezing conditions whilst out on the slopes. 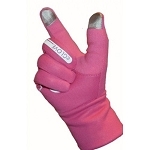 They offer a unique, patented easy access digit system, with two fingers of conductive fabric cleverly hidden behind slots in the forefinger and thumb, allowing you to continue using any touch sensitive device whilst out skiing or snowboarding with your gloves on! The conductive technology in the pads allows you to operate any smart phone, GPS unit, tablet or other device with a capacitive touch screen, without exposing your fingers to the cold outside. 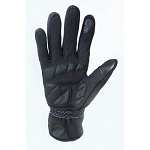 Made of a combination of tough polyurethane material on the palms, with lycra and velvet inner for comfort and warmth, these gloves are perfect for taking out onto the pistes, whether you enjoy skiing or snowboarding! 5 sizes avaliable: extra small, small, medium, large and extra large. When I first ordered these, I took the large size, these were much too big, so I sent them back and within just a day or 2 I was sent the medium pair. This was a very fast turn around and an example of great customer service! The gloves themselves are fab! Although I have yet to test them in the appropriate conditions (it is still October, so no snow as yet), it is so easy to operate my HTC Sensation phone with them and to open zips on my jacket etc. It will make life on the slopes so much easier - no more freezing my hands off whilst making a call on a ski lift or having to take my gloves off just to open my zips a little. I can't wait to show my mates, they are all gonna want a pair!